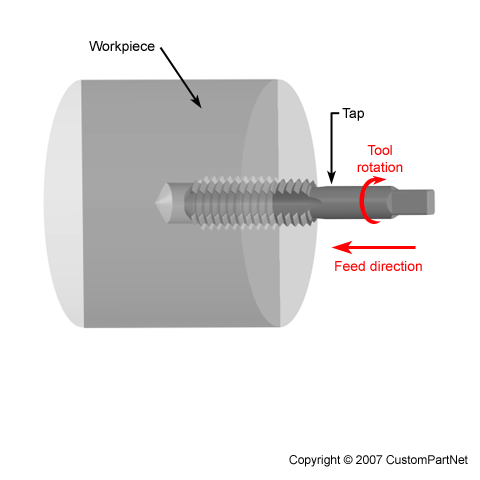 An operation in which a tap enters the workpiece axially and cuts internal threads into an existing hole. 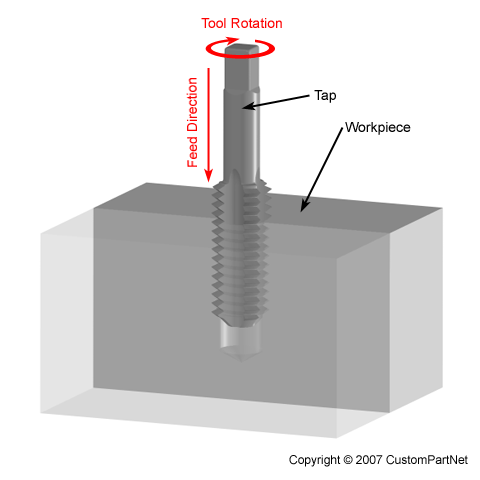 The existing hole is typically drilled by the required tap drill size that will accommodate the desired tap. 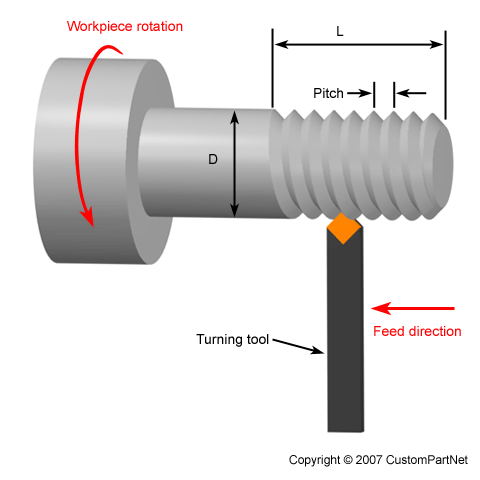 On a milling machine, the threads may be cut to a specified depth inside the hole (bottom tap) or the complete depth of a through hole (through tap). The amount of longitudinal stress a material can sustain when in tension, measured in units of force per unit area. Tensile strength is commonly expressed as megapascals (MPa) or pounds per square inch (psi) of original cross section. The amount of stress that a material can withstand before it yields and plastically deforms is referred to as the tensile yield strength. The maximum stress that a material can withstand before eventually failing is called the ultimate tensile strength. Tensile strength is measured by placing a standard test piece in the jaws of a tensile machine, gradually separating the jaws, and measuring the stretching force necessary to break the test piece. The measure of how rapidly heat is conducted through a material, measured in W/m-K or BTU-in/hr-ft2-F.
A measure of the rate at which heat flows through a material. Thermal diffusivity, typically measured in mm^2/s or in^2/hr, is equal to the thermal conductivity divided by the product of specific heat and density. The thermal diffusivity of most common polymers ranges from 0.09 to 0.14 mm^2/s (0.50 - 0.78 in^2/hr). 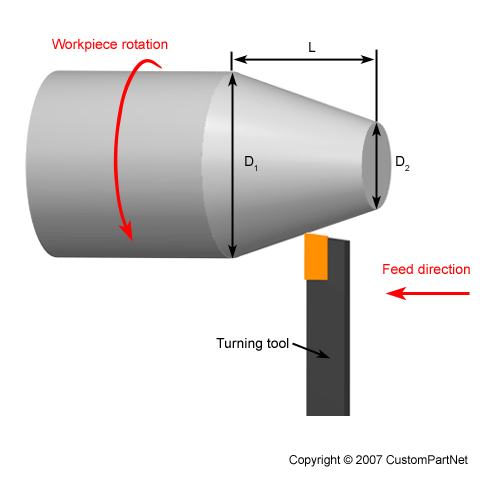 A turning operation in which a single-point tool, typically with a 60 degree pointed nose, moves axially, along the side of the workpiece, cutting threads into the outer surface. The threads can be cut to a specified length and pitch and may require multiple passes to be formed. 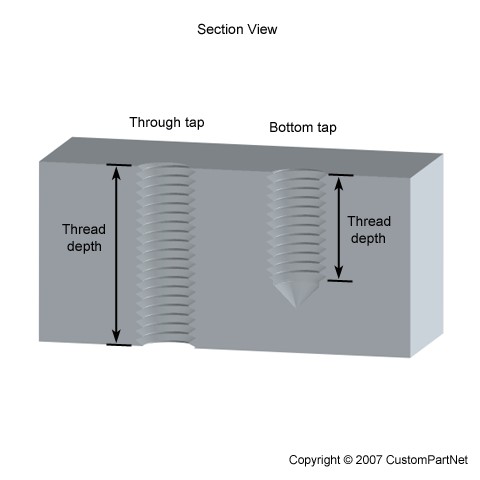 Pitch is a measure of the spacing between threads. The English standard is to measure pitch as the number or threads per inch (TPI), while the Metric standard is the distance in millimeters (mm) between threads. A hole that extends completely through a portion of a part and therefore is open at both ends. Chemical symbol Ti. Element No. 22 of the periodic system; atomic weight 47.90; melting point about 1668ºC (3270ºF. ); boiling point over 3287ºC (5430ºF. ); specific gravity 4.5. A bright white metal; very malleable and ductile. Its principal function has been as an alloy in steel making, but now is being used extensively (especially in aviation and aerospace) because of its high strength, light weight, and good corrosion resistance. As an alloying element in steel, tin: (a) reduces martensitic hardness and hardnability in medium chromium steels. (b) prevents formation of austenite in high-chromium steels. (c) prevents localized depletion of chromium in stainless steel during long heating. (d) added in small amounts give a finer grain size. (e) acts as a carbide stabilizer in austenitic stainless steels and is used to prevent intercrystalline corrosion, commonly termed "weld decay". Titanium carbide is also used with tungsten carbide in the manufacture of hard metal tools. Also referred to as dimensional accuracy, tolerance is the amount of deviation in a particular dimension of a part, which results from the manufacturing process. 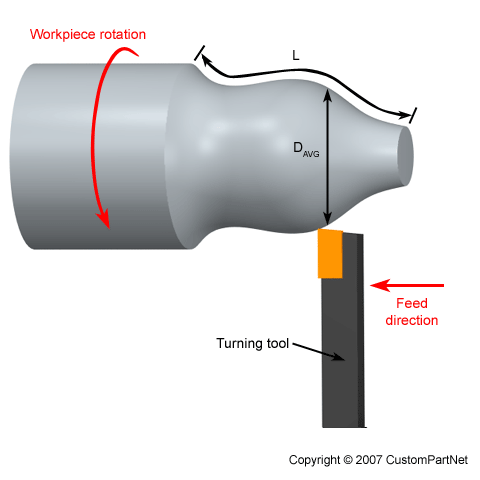 The distance that the tool must travel between the workpiece and the location that is required for a tool change. This distance is traversed at the rapid travel rate before and after a tool change. This distance depends upon both the workpiece and the tool, so the average distance should be used. 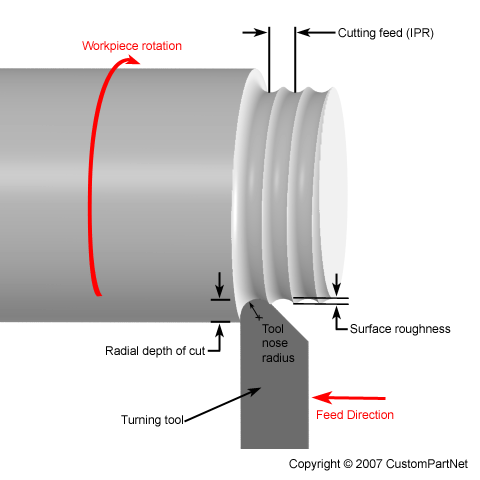 The diameter of the cutting portion of a cylindrical cutting tool. The cutting portion is the length of the tool containing the flutes or teeth that cut the material. In some turning operations, the single-point tool used for finishing has a rounded front corner or "nose". The radius of the tool nose, along with the cutting feed, will determine the surface roughness formed by the finishing operation. For a given cutting feed, a larger nose radius will provide a better finish. A sharp edge along the circumference of a cutting tool, such as an end mill or drill bit, that cuts into the workpiece. Cutting tools may have one or many teeth, but 2 or 4 teeth are the most common. (1) Capacity of a metal to absorb energy and deform plastically before fracturing. Usually measured in a notch impact test, high impact values indicating high toughness, but the area under the stress-strain curve in tensile testing is also a measure of toughness. (2) The ability of a metal to rapidly distribute within itself both the stress and strain caused by a suddenly applied load, or more simply expressed, the ability of a material to withstand shock loading. It is the exact opposite of "brittleness" which carries the implication of sudden failure. A brittle material has little resistance to failure once the elastic limit has been reached. A turning operation in which a single-point tool moves axially, along the side of the workpiece, removing material to form different features, including steps, tapers, chamfers, and contours. These features are typically machined at a small radial depth of cut and multiple passes are made until the end diameter is reached. For a finish operation, the cutting feed is calculated based on the desired surface roughness and the tool nose radius. A machine, also called a lathe, which feeds a cutting tool into a rotating workpiece to cut away chips of material. 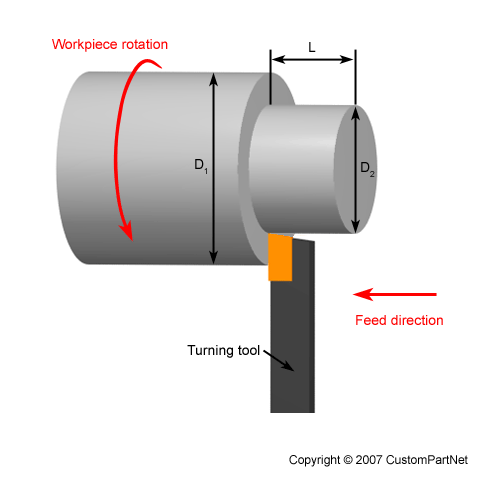 A turning machine may be operated manually or by computer numerical control (CNC) to perform a series of operations. External operations which modify the outer diameter of the workpiece include facing, turning, grooving, cut-off, and thread cutting. Internal operations which modify the inner diameter of a part include drilling, boring, reaming, and tapping.